I’ve found myself falling into a rut, a lull for the past few weeks. There are other portions of my non-tech coach job-life that aren’t as engaging and visible, and it’s fairly easy to fall into a vacuum. It’s not good for me at all and doesn’t keep me accessible. Today was a different kind of day. After figuring out what standards she was obligated to meet, we combed through her lesson asking ourselves if that was going to help us get to the finish line. If it was, then were tweaks we could make to make the lesson more engaging. Several of the tweaks we made, had little to do with technology. For example, we brainstormed the idea of bringing in guest speakers. Any decent Tech. Coach is going to tell you that not every lesson needs to be infused with transformative technology. Sometimes non-techie things are better. Of course, I wouldn’t be me if I didn’t try to pitch some super fun tool. Today Explain Everything, Pear Deck, Kahoot, and Google Drive seemed to fit just right. Each one offered something that couldn’t be done easily without technology and will give the kids an enhanced learning experience. Today was a great day, and I was honored to have the chance to work with a teacher. I can’t wait to help out in the classroom and see all of this brainstorming come to life. You will gain nothing with arrogance and righteousness. Regardless, of your skill and accomplishments, someone will always be better than you. Rather than tear your neighbors down, build them up. I promise, there’s enough success to go around for everyone. 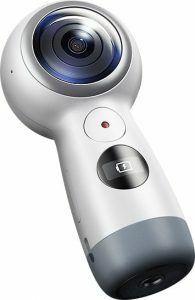 If you’re exploring 360 photography, there are many options available, but the top two that come to surface for me are the Samsung Gear 360 (2017) & the Theta S. Both are phenomenal 360 cameras for anyone looking to get started in photosphere photography. Now that I have experience with both, I’d like to share the plusses and minuses to both. Straight out of the box easy to use. Seriously, I was using mine within minutes of arrival. 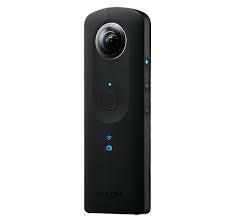 You just need to download the Ricoh Theta app on your smartphone and off you go. Photos transfer back to your phone right away. After you take the photo, the camera will begin transferring the image back to your phone. You won’t have to remember to do it later. Location information is turned on by default. When you upload photos to Google Streetview, GPS information will make that process so easy. The Theta+ and the Theta Video app are phenom for editing. The Theta allows manual tweaks of features like ISO and shutter speed. Connectivity to your smartphone can be sassy. I’ve had plenty of times where it wouldn’t connect to my Samsung S8+. My only recourse was to restart the phone. The video quality is just okay. The video quality is 1920×1080, but by the time you send it to Facebook it’s not even worth sharing. I would be remiss if I didn’t admit that I returned my first Theta. It was defunct. Luckily, Amazon’s 15-day return policy afforded me a no-hassle return policy. I was still super frustrated when I realized it was broke after I climbed a bluff for an awesome shot. The second theta has been great. The price is right. At about $120, you can have a fun little 360 camera. The video and photo quality are nice. I wouldn’t say “professional quality” under just any conditions, but if it’s the morning or afternoon on an overcast day or inside, you’ll like what you take. The video quality is better than the Theta. Moving photos back to your phone is a bit tricky. You’ll get the hang of it, but it’s not as automatic as it is with the Theta. It requires a micro SD card. Really, that’s not a bad thing because it can hold more videos and photos, but it is an added cost that you might not realize. If I remember right, I bought mine for an extra $30 dollars. The default setting is to NOT include location information. I took about 25 pictures and didn’t realize this until I went to upload to Google Streetview. Boy, was I mad! Editing on the Samsung app isn’t as good as the Theta app. The options aren’t as creative, although I’ve been able to edit Samsung photos on the Theta App. That speaks volumes to the Theta app, right? Well, ideally I’d suggest that you save up your pennies for the Theta V, but at $430, it’s tough to justify if you aren’t planning to recoup your investment. So, if you just want a bunch of fun photos and videos, I’d go with the Samsung Gear 360, but be prepared to spend time getting the hang of it on events that aren’t crucial to catch. There’s a bit of a learning curve. If you’re not a techie, and you just want 360 photos, then go with the Theta. Both devices are super fun and offer all sorts of creative options. 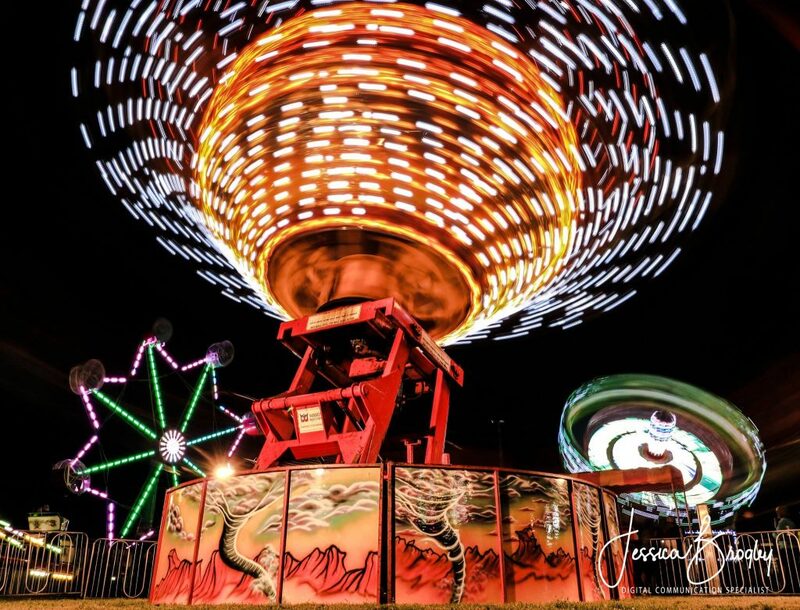 When I moved down here I was so surprised that several communities have their own fairs. Where I grew up there was just one, the county fair. Down here individual community spirit is very much a fabric of our culture. Each event might have a little midway and almost always there are kids showing animals or other exhibits. Platteville hosts “Dairy Days” just a few weeks after the Grant County fair. Gosh, I think the Belmont fair might be after this one too. I’ve lived here about five years and events like these are near and dear to my heart because they resemble a precious community spirits that each town possesses. Multiple generations engage in these events and, from what I gather, not much has changed. And that’s okay. 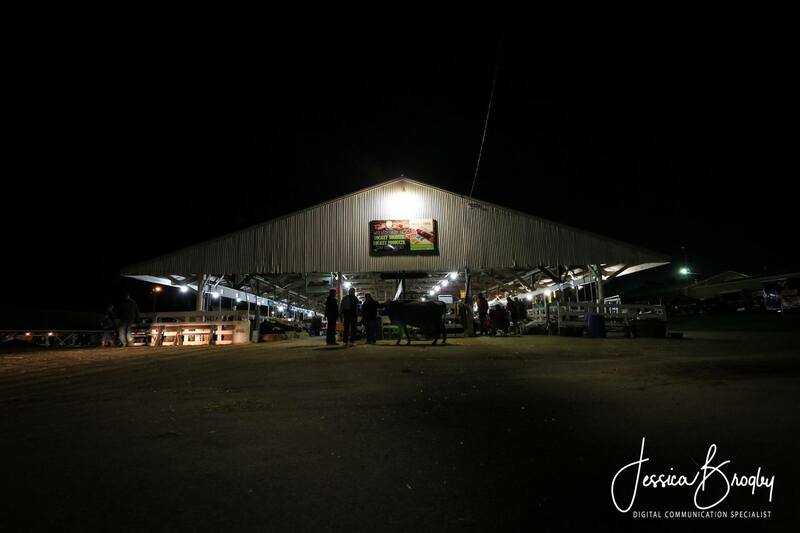 This marks my first time walking the barns at night, and I was sure thankful to do so with my camera in hand. I love the sounds of the animals settling down for the night and folks finishing up late-night chores. While the daytime is so very busy, the evening is satisfying, signifying the conclusion of yet another memorable day. The barns have a certain peace about them late at night that’s really neat. Recently I was asked to talk about Chrome Apps and Extensions for students with special needs, so I’m leaving my ideas here. I do want to say though that these tools are good for any learner. 1. Read Write. What an amazing tool. The free version offers text to speech which, in my opinion, is the best feature. Note that the paid version comes with all sorts of goodies. I do have to, however, note that the paid version is better to be purchased district-wide. The smaller the group, the most costly. 2. Mic Note. Mic note reminds me a Evernote without the frustration. Mic Note is very easy to use, stores to the cloud, and contains multiple features that make note taking easy. Note that the free version only allows for ten minutes of audio per note, so the student will not be able record long lectures. 3. AdBlock. So Adblock isn’t going to help them learn content, but it reduces distraction. I dislike seeing advertisements all over students’ screens. AdBlock reduces those occurrences. 4. Mercury Reader. Formally called Readability. This app clears the clutter from a website you need kids to read. Let’s face it – digital media is busy. If I have to read multiple pages online, my attention is drawn to all the other text and imagery. Mercury Reader flips the page to a distract-free version and allows the user to change color contrast and font size. After you launch Mercury, you can make these changes. 5. Grammarly. This app catches grammar mistakes but goes beyond just spelling errors. As students type, any mistakes or possible mistakes will be highlighted in a coral color. It is, by far, more accurate than just using spell check in Googledocs. Students should be logged into Grammarly for more free features. There are LOTS of Chrome Apps and Extensions that can be beneficial to students with special needs, anyone actually. I would caution you against installing 15 of them at the same time. 🙂 There are extensions that cause glitches in Chrome, and it would be easier to narrow down the culprit, if you only tried a few at a time. Just know that there are great Chrome App and Extensions that can assist students in controlling their own learning. Try a few out. Share with students and be ready to support them through the process. Not all students will not use these tools without your reminders or support. And practice what you preach, right? Use them yourself too! And lastly, share your experiences with your colleagues! This is what the FREE Read Write tool bar looks like. Read and Write for Chrome offers annotating built right into Chrome. What an awesome tool! It’s a tool bar that installs in your Chrome browser so you can annotate or utilize speech to text. The free version does NOT offer the ramped up features you are going to want. For example, you will not get the speech to text features, word prediction, highlighting annotations, or even ability to insert pictures. All three are certainly helpful, but just a carrot to get you to consider the whole package. 🙂 To make matters more tempting, teachers can access the premium version for free. Southwest Wisconsin is rich in history, and there are several resources calling your name. When I moved to Southwest Wisconsin four years ago, I fell in love with the idea that I could visit so many places and experience history with primary and quality secondary sources. Check out the map below for a list of great places for you to visit. Of course, before you head for visit, check hours of operation. Enjoy! About two months ago we moved into a new home. The basement is large, but missing my do-it-yourself green screen I created in the old basement. The basement has unfinished drywall, but I still didn’t want to paint the walls lime green just quite yet. I was in Hobby Lobby this weekend (giant craft store) and found a bolt of lime green poly fabric. You know — when you go to a conference and get a free bag that is a mix between fabric. That stuff. It was $2.99 yard and there were seven yards left. I knew that I needed something 7ft tall and at least 6ft wide. I’m not good with meas uring, but the gal at Hobby Lobby figured I’d have a lil’ extra, so I took it all. My first step was to cut even panels. I had enough for three single-ply panels. I really wanted two-ply because there’s a light that shines behind the screen. Unfortunately, I didn’t have enough fabric. So I cut three even panels and stitched them together. I didn’t press or pin because I’m, well, impatient. Seriously though, it’s no big deal. This fabric burns easily so don’t try to iron it. If you’re bent on ironing, then you have to place a barrier between the iron and the fabric. If you don’t, it melts in seconds. After the panels are stitched together you need to make your top. You have choices here. I decided to take the quick route and run duct tape across the top. Had I been more patient, I would have sewn a casing for a shower curtain. The downside to that decision, though, would’ve been a shortened curtain and additional cost in a shower curtain rod. So far I’m happy with my decision. After folding over my duct tape, I used a paper hole punch to run a hole every 4ft. The header in the basement was at just the right spot, so I found some old tea cup hooks. I screwed them in every four feet and hung the curtain. I didn’t know if I had enough fabric to stretch across, but it turned out I had an extra 2ft. I cut it off and gave the top another punch hole. Once I was done, we gave it a test using the Do Ink app — it worked great. I still think I need to invest in a lamp, but that’ for another day. Total cost — Under 15 dollars! Back in November, Google offered our district the chance to try “Team Drives.” I promptly applied and was granted access shortly thereafter. So far, it’s been a pleasant experience. I’m looking forward to seeing where this goes! For early adopters, Team Drive is a link under My Drive. The idea is simple — You can upload files to a folder under Team Drives. From there, users can edit and share files as normal. Should someone leave the team, the files stay in Team Drives. This will prove useful when grade-levels are sharing content. For example, our second grade team created a plethora of content, but this fall teams were rearranged. I suspect it was quite a challenge to share content with the new members of the team. Team Drives would have eliminated that hassle. Honestly, team-level or subject-specific curriculum could be housed in Team Drive with the collaborators being all teachers of that content, curriculum coordinator, and any technology integration specialists. I was thinking, however, that people could not delete content in a Team Drive folder. That is not the case. I ran a test where I jumped into someone else’s Team Drive folder, and I started deleting content. It is still entirely possible to delete files out of a team’s Team Drive. Additionally, I was not able to move entire folders over to Team Drive. Any folders have to be downloaded and reuploaded. I suspect that will quickly change. Lastly, I was not able to “Save to Team Drive” from Gmail. Again, I’d have to download the file and then upload to Team Drive. I’m betting that one will change too. Despite those few gaps, our staff is really enjoying the Team Drive experience. The tool supports teachers that want to share and collaborate on curriculum and projects. If you’re interested in learning how Team Drives can work for you, take a peek at the Early Adopter program.